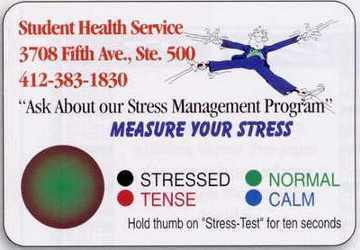 Custom Stress Cards Personalized in Bulk. 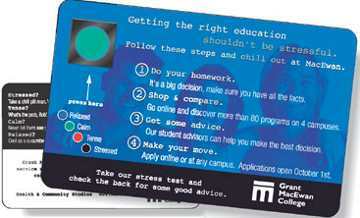 Promotional, Inexpensive Mood Cards with Biodots. Lowest prices in the USA and Canada. Free Full Color imprint on both sides. 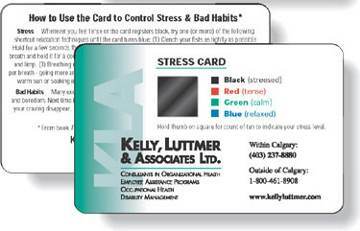 The Liquid Crystal stress indicator may be placed anywhere on the card. Prices include full color imprint on both sides. The back side may contain a calendar, a sports schedule or the imprint of your choice. Full Color Imprint front and back! Thickness: 0.010" (10 mil.) white gloss vinyl. Other thicknesses are available: contact us. Prices below include your custom full color imprint front and back. Production Time: 5-10 days after art approval. Contact us for faster delivery.